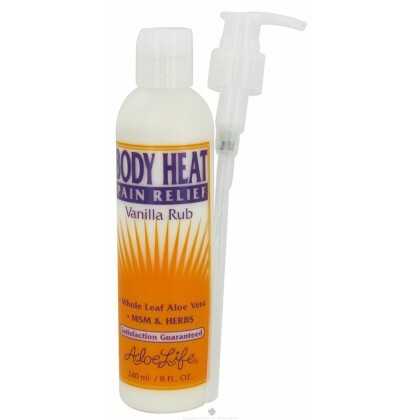 AloeLife Pain Relief Vanilla Rub soothes body aches with heat. Penetrating, lubricating, warming and healing agents of Menthol, MSM, Whole Leaf Aloe Vera Juice, Arnica and other herbal extracts relieve tension and soreness due to athletic injury, physical exertion, gardening, arthritic aches, broken bones, shoulder tension, old injuries, carpal tunnel, daily stress and fatigue. The 100% natural Vanilla extract leaves a delicious fragrance with a non medicinal smell. Provides deeper longer lasting relief due to the carrying ability of Aloe Vera the nutrients are carried down to the source of pain to help eliminate it while soothing.